Email templates make sending emails to your clients easy. No more typing the same thing over and over again. Save the messages you send the most often as a template and save time. You can also use tokens to dynamically populate job or client data so the email is ready to go out when you want to use it. To start building your Email Templates go to Settings › Email Templates. You’ll set up your email templates with a certain ‘Email Type’. This determines where in the system the template can be used and also provides context for the tokens inside the template. General Use emails are available in the templates menu when on the job’s Mail tab. They are the most non-specific type of email and can be used for a variety of reasons, most often used for initial inquiry responses, follow ups, etc. When looking at a sales order that has an open invoice, you can use the actions menu to ‘Email Direct Link’ which will bring you to an email composer. 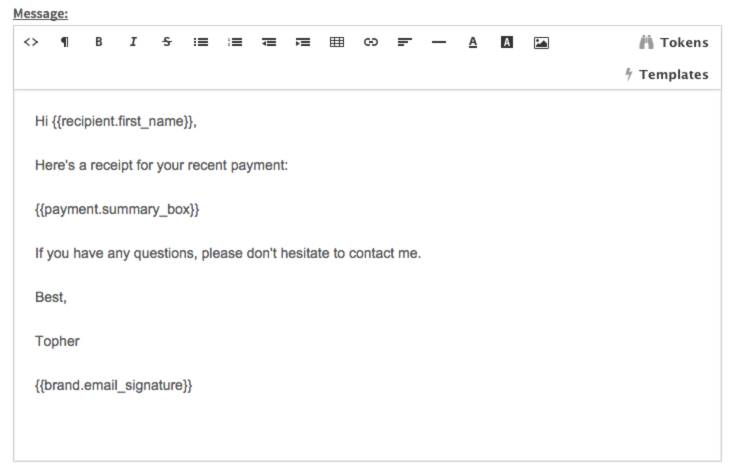 The templates menu in that email composer will show your Invoicing email templates. 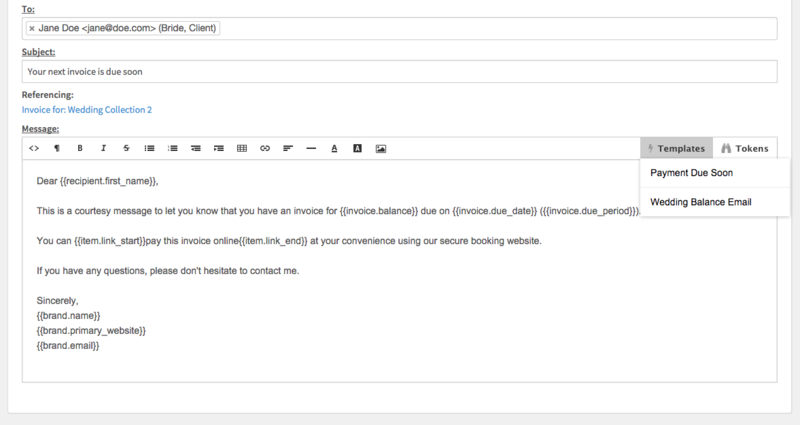 If you have one of your Invoicing email templates set up as the default it will populate the message automatically. 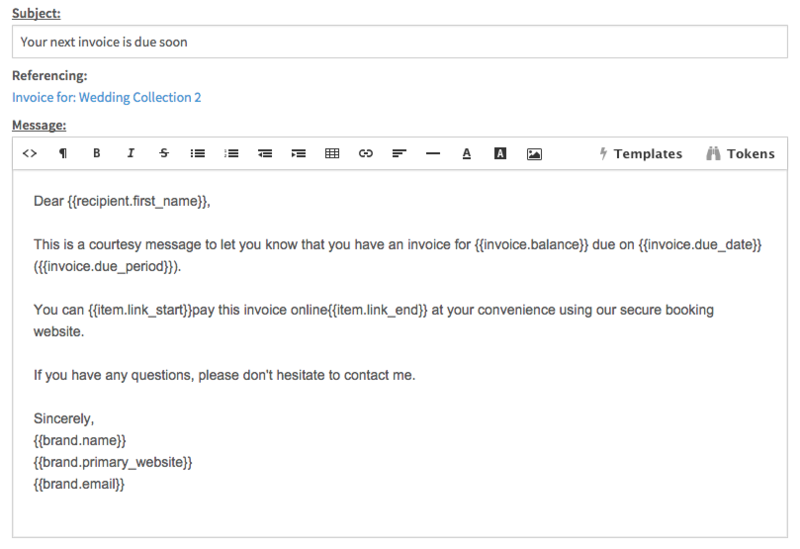 You can, however, use the templates menu to use any of your other Invoicing email templates. Notice that there is a line under the Subject that says what item the email is referencing. In this case it’s the ‘Invoice for: Wedding Collection 2’. This is important to remember when using tokens. We’ll talk more about it below. An email composer will appear and all of your email templates that you’ve marked as ‘Order Receipts’ will be accessible from the templates menu. Notice how the email is referencing “Wedding Collection 2” which is the name of our original order. This will affect which tokens work in the email. There are two ways that Payment Receipt emails are sent: automatically when a payment is made with a credit card or manually when you go to the Financials tab on a job and click on the little mail icon next to the recipient’s name. When you set up your payment gateways through one of the numerous payment processors, you can specify which payment receipt template is sent to your client automatically. You can learn more about that here. In your payment receipts email, you can use the payment.summary_box token to add payment details that are sent to your client. 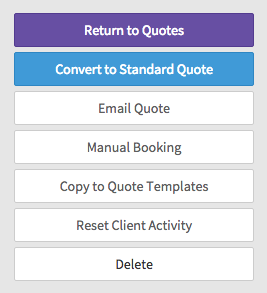 After you’ve created a new quote from the Quotes & Orders tab on a job, you can click the ‘Email Quote’ button to send it. A new email composer will appear and you’ll be able to access any of your Quote Invitation email templates from the templates menu. Notice how right below the subject line, the email is referencing ‘Family Session Gift Certificate’. That is the context of the tokens in the email. More on that below. A new email composer will appear where your Questionnaire Invitation email templates will be available from the templates menu. 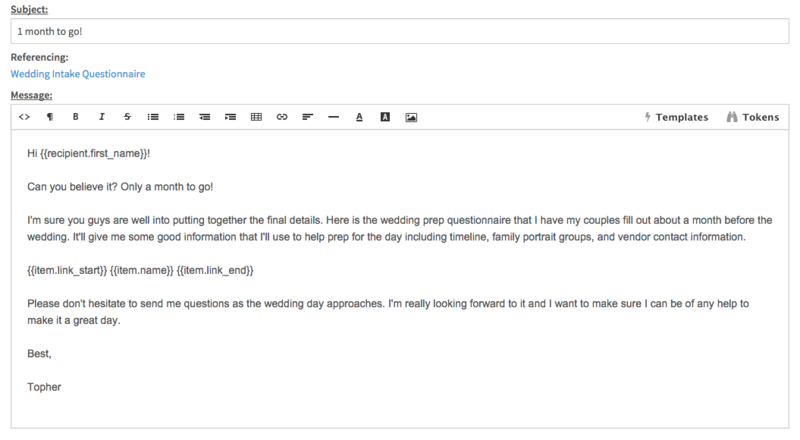 Notice how under the subject line, the email is referencing the Questionnaire we’re sending. More on that below. A new email composer will appear and you’ll be able to access any of your contract email templates from the templates menu. 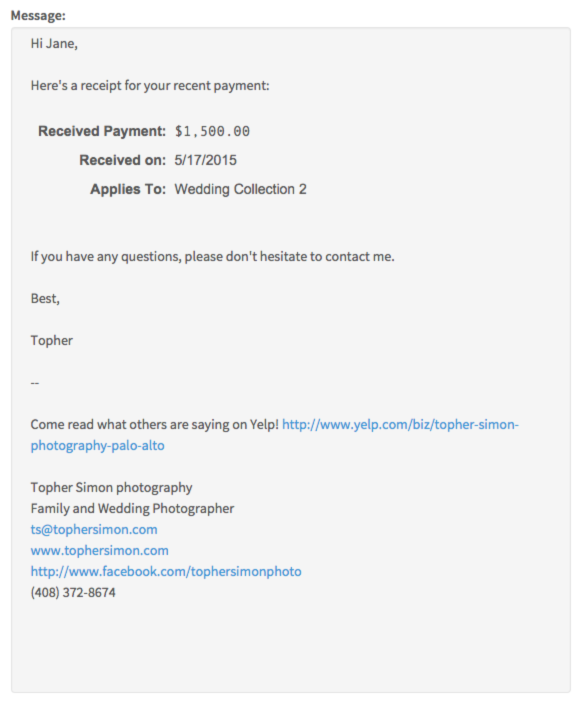 Notice how right below the subject line, the email is referencing ‘Wedding Photography Service Agreement’. That is the context of the tokens in the email. More on that below. 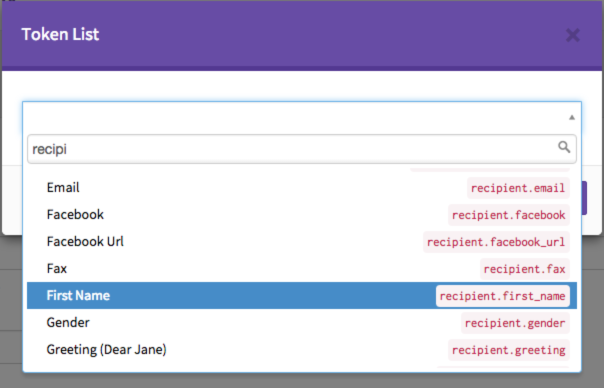 Tokens allow you to populate data into your emails without having to type it manually. You’ll then be presented with a token browser where you can search for and insert tokens. Click here for a complete list of tokens available. Because tokens are data specific, they need to be in the right context in order to show the right information. 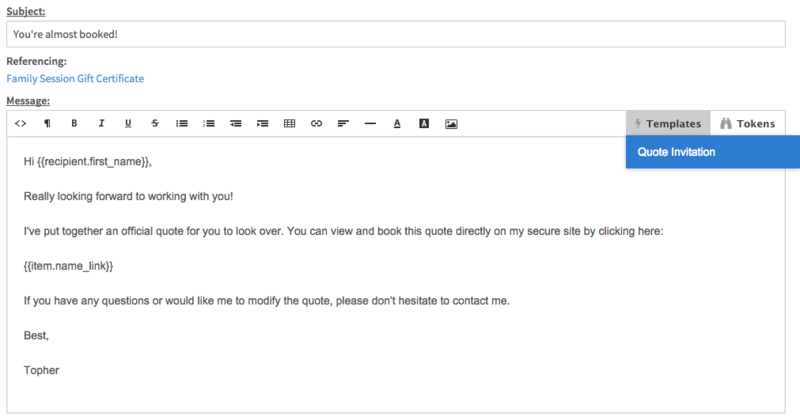 Remember how when we are sending our email templates above and each email type has a different item it was referencing? 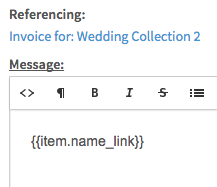 In the example below our ‘Invoicing’ email is referencing ‘Invoice for: Wedding Collection 2’. Because we are referencing an invoice in this case, the invoice tokens will work. Outside of an ‘Invoicing’ email, the tokens won’t know what data to fill in there because it will be out of context. Item tokens represent the referenced items in our emails. Whenever we’re using an email template, other than a ‘General Use’ template, we’re sending a link to something; a questionnaire, a proposal, an invoice, an order, etc. So there are certain tokens, that we need to ALWAYS include in those emails. They are our ‘item’ tokens. We can actually use several different methods and achieve the same results. 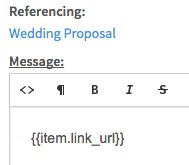 When used alone, this will create a hyperlink to the item you’re referencing. Using the item link start and end tokens turn everything in between them into the hyperlink to your item. Just like Method 2, we’re using the item link start and end tokens to turn everything in between into a hyperlink. We’re also adding the item.name token to insert our referenced item in there. Please complete our Wedding Proposal. our Wedding Proposal will be hyperlinked here. This method works, but it’s not the prettiest.